melanie has a great eye for fabric... and only sells the best of the best in her shop! Millie's Market Bag by Izzy & Ivy! valori wells corduroy from her nest line! so what is she giving away to one of you?? 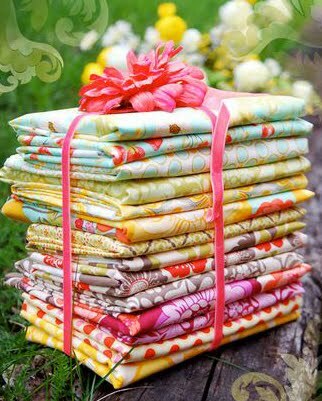 a fat quarter bundle of Sandi Henderson's new line Meadowsweet 2!!! she is offering a discount just for you! blog or tweet about this giveaway & let me know you did! you have till 10pm est on Wednesday the 4th to enter! so you got all that?? 2D Zoo by Alexander Henry - such cute and modern fabric for baby quilts! i just checked teresa out..
and she has a family blog & just started a quilting blog! so go pay her a visit! The Lollipop Dreams - Purple is so cute! Definitely love Meadowsweet 2, the new colors are so pretty! Excellent! I'm in the market for some voile, so I appreciate the discount code. I have my eye on Forest Hills in Sea. I just signed up for the newsletter. Thanks for the intro to this shop! So as soon as I opened the website I saw the Double Border Daisy Lime and instantly fell in love. Those are the same colors in my daughters room and would make a perfect curtain, pillow, bedspread, you name it. Love it!! Hi this is one of my favourite shops! I love the Willow collection. I love Just Dreamy by My Mind's Eye. Such pretty colors! Thanks for lettin us know about a nice site. My favorite fabric is Monaluna Scooters--who can resist those cuties?! Hi and thanks for another cool giveaway ! I retweeted on twitter ! I've been drooling over Meadowsweet2 ! But the Dolce in her shop is gorgeous! How to choose, how to choose? I do like the Momo Balls and butterflies fabric. So many cute dots and things. I think one of my favorite fabrics is Loden poppy parade , meadowstreet2 ; there are many pretty fabrics !!! I signed up for Above All's newsletter. Can't wait to hear more. I signed up for the newsletter. Thanks for the intro to such a great shop (and a discount)! i love the Wildwood tree in fuschia! My favorite fabric is definitely the Little Folks voile. I missed out on the first wave, so it's nice to finally find someone who has some in stock! Thank you for the chance to win this beautiful fabric. Lollipop dreams is my favorite. Oooh....pretty, pretty fabrics!! I adore the new Monaluna Monaco collection, especially the teal scooters! Bella Basics - what's there not to love about this fabric ?! And I receive their newsletter, albeit with a different email address - writermom1219(at)gmail(dot)com. Thanks for the awesome giveaway!!! My favorite collection is "Monaco" - love those scooters! Joel Dewberry - Flowerfields in Berry. So pretty. I love the Freebird Jelly Roll. Too many choices to pick a favorite...I m trying to increase my stash of dots and stripes so I was drawn to those. Wow! Another great giveaway. My favorite fabric over at Above All Fabric is Poppy. I know shocking that its not Make Life but I love the bright colors/tones in Poppy. I just signed up for Above All Fabrics newsletter. I think my favourite fabric is Mo Bedell's line Party Dress, especially the hexagon cheater prints. I can't narrow it down. i love the Meadowsweet 2 and Little Folks. I already receive Melanie's newsletter! I love the AH starling print. And I'm signed up for the newsletter. Meadow Sweet 2 is my favorite fabric line at the moment, especially those pieces in robin's egg blue! And I've signed up for the newsletter! I tweeted and blogged about the giveaway. Thanks again for the great giveaway I love this fabric line. Love the Marilyn by Free Spirit. Thanks for the give away! Meadowsweet 2 is my choice of fabric! I love this collection! Monaco and Dolce are my favorites! I have signed up for the newsletter. I'm loving the Monaco by Monaluna! Ack! So much awesomeness to choose from. I LOVE the pink honeycomb in the Modern Meadow collection. dogwood stripe - aqua - from Poppy. Still love this one! Thanks for the chance. And introducing us to a great store. I love the blue wallpaper fabric by Art Gallery! I love the new Meadowsweet. This is so great! I am really in love with Meadowsweet right now and am so happy to see Meadowsweet2 coming out. My favorites would be Meadowsweet2 of course and then Dolce. I love that Nest fabric! Hope dot by Heather Bailey, just in love with that print! Thanks for the giveaway! Oh my, I like them all, but for a favorite I'm stuck between Make Life and Summer Song. I can't decide which I like better! All of the fabrics are beautiful but one of my favorites is Modern Meadow! Signed up for the newsletter! I'm still loving Little Folks, and of course, the new Meadowsweet 2! Thanks for the giveaway! I've signed up for the newsletter. I love the Poppy collection! Thanks for the giveaway! I really love her site. Such a clean looking one too. I really like the way she has a white background rather than something busy drawing attention away from what you are trying to read. Great job! And her fabrics are all great choices. SO many I would love to buy, but if I had the money right now, I'd start with the Flowerbed-Teal by Monaluna. So pretty. GREAT patterns too. Many I've never seen. LOVE THE SITE! I love the Robin's Egg Daisy Path and just ordered some and received it from her shop! I have definitely signed up for her newsletters. I really love the way she has her shop set up and some of the patterns I saw there too I might need to pick up at some point. For the fav fabric (at the moment) that's an easy one, PURE from Sweetwater!!!! I'm so in love!!! The argyle OMG!!! Signed up for the newsletter!!! I think I'm going to have to go with all those lovely folksy flannels!! I still love Joel Dewberry's Modern Meadow. I have GOT to get some of that! My favorite pattern from this collection is the Vintage Paisley. What a great giveaway, thank you for the opportunity! I also signed up for the newsletter! I really liked the chinese laterns in purple. It was different and fun!! I signed up for her newsletter. So many really beautiful fabrics to choose from! Today I would say the Dream Dots print by My Mind's Eye is catching my attention the most. I love the snow monkeys....and the counting monkeys :) I could say it's my two year old's favorite, but in all honesty, it's the Mommie's favorite too! Love the Michael Miller Flower Shower fabric. I signed up for the newsletter. Thank you Jaybird for leading us to this neat website, and congrats on your new column! My favorite is the Party Dress, but what would I sew with? Nicey Jane because that is what my girls like...sigh! I don't blog and don't do twitter, but I will put this on my facebook! Love the birdy corduroy fabric and the giveaway fabric are amazing! Thanks so much for your intro. I signed up for the newsletter too! this is an awesome site! Can't wait to get the newsletter (which I signed up for) and find out when that new riley blake is coming in. Perfect for my little boy!! Thanks Julie! I love the Red Henna Garden but they are all so great. I am now a subscriber to the newsletter. Thanks for sharing a new (to me) fabric store! I love the AMH voile - it is amazing! I love the Monaco Scooters!! Tweeted the giveaway, used @jaybirdquilts! Signed up for the newsletter, too! I love the Henna print in Medowsweet 2! I'm signed up for the newsletter too! I love "Tweet Tweet". So very cute. Ooooo, I love the Poppy collection. So beautiful! Im excited to start getting the newsletter! I love michael miller's flora and fauna! Right now, I am really in love with the Strawberry Fabric that is in the Meadowsweet 2 line. I love all of the great dots and ordered some. Of course I signed up for the newsletter! I would have done it the other day if I would have noticed the option down there. I want to get my hands on Meadowsweet 2! I loved the first line, can't wait to see the second line in person! I am anxiously awaiting the arrival of PURE!! I blogged (it will be posted Aug. 3rd on http://minimatisse.blogspot.com/) about the nest line but I really like the Teal Scooter. It was fun to look at all those wonderful designs. I signed up for the newsletter too. My fav thing in her shop isn't so much a fabric but the Claira and Clancy Pig Dolls pattern. I love those lil piggies! I'm in love with the Monaluna Monaco collection. One day I hope to have them all! Favorite fabric: Full Moon Polka Dot - Lime. But wow! so many beautiful greens. I think I need to go back and shop now. I like the Alexander Henry 2d Zoo prints. But, the truth is that I like most all of the fabrics and they'd be welcome addition to my stash. The giveaway fabric is really really pretty! Such adorable fabric! I love all the Creature & Critters, especially Owls & Lions. Can't wait until I have a grandchild to make some cute quilts for! I really do love the Oceanside bundle there. The bundle prices are pretty good too. I did sign up for the newsletter there. Signed up for the newletter! She has my much-loved Make Life! I signed up for her newsletter! Meadowsweet 2 all the aqua prints the most! What a great fabric giveaway!! I am signed up for the newsletter! I love love love the Happy Tones line by Michael Miller - I am already planning a project using the Flower Power, Stripe Hype and Ta Dot fabrics! thank you for the giveaway and introducing this great web-site! And I signed up for the newsletter too! I love the Monaco line, especially the birds! so cute. Great giveaway with such a giant stack of gorgeous fabrics! I am new to Above All Fabrics, so I'm going to check it out more. Thanks for the tip! I am really loving Patty Young's new Playdate line especially the Pretty Flowers - Turquoise, its my favourite colour. I like the Farmer's Market and Ginger Blossom. I already get their newsletter. Great store!! OMG I love the Meadowsweet line!!! The dark blue of Blue Hill's Scatter Garden - Shindig really caught my eye. Love seeing mfr's that my LQS doesn't carry like Blue Hill and Monluna. I am registered for the newsletter now! I like Lindy Leaf blue. It would be good for a little boy. Fun giveaway. Thanks for the chance. I love their Oceanside bundle (I'm a sucker for any fabric store that offers mixed-line precut bundles!! I signed up for their newsletter too! It was so hard to choose just one! I chose Meadowsweet, but I also loved the Blush fabric's. They are all so very nice. I signed up for Above All's newsletter. Thanks for the giveaway! I signed up for their e-mail list. What an impossible task!!! How can I pick just one favorite product? Well, one of my favorites is the fabric Speckle Henna Garden. Love it! I"m a sucker for polka dots. I've been eying those nicey jane ones for a while! I just signed up for the newsletter. What a cool store! I love the Monaco bundle...Great Fabric! I absolutely covet Anna Maria's voile Diamond Mine in Ink - it would be a great transitional garment fabric for those of us who reside in north Texas! I love the Organic Cottons that she carries. I'm excited about the Monaco collection. My favorite fabric besides Meadowsweet would have to be Oceanside. Signed up for the newsletter. So beautiful! I popped over there and loved it all. If I had to choose, it would be any of the Summer Song fabrics by My Mind's Eye. So pretty and I love birdies. I signed up for their newsletter. Really love this store and I will be shopping there this week, yay! I like Valori Wells' paisleys! I signed up for above all fabric's newsletter. Love Alexander Henry's 2d zoo in the pool colorway! Thanks for the sweet giveaway! wow! Thanks for posting this! I'd never heard of 'Above all' and now they are bookmarked on my computer for fabric site! ok...to pick only one is impossible! I love Meadowsweet, modern meadow, nicey jane there's just no way to pick my favorite! "Never been to that site, thanks! I love the midnight bubbles, grays with a pop of lime green. "